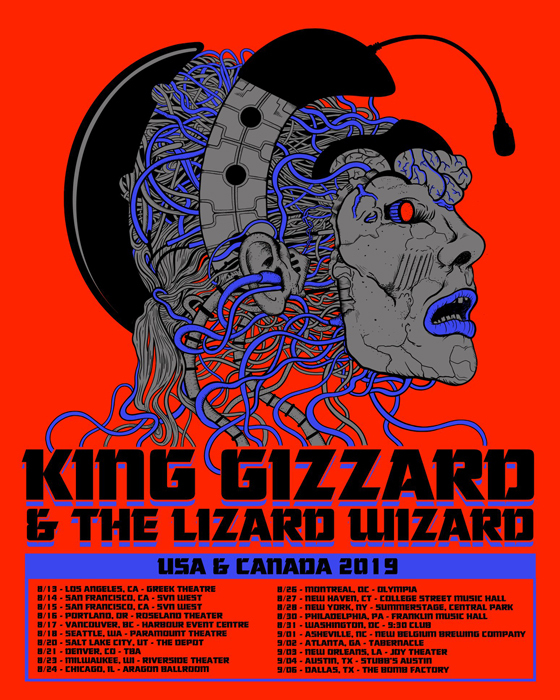 A week after sharing new single "Cyboogie," King Gizzard & the Lizard Wizard have announced plans to tour North America later this year. The Australian outfit will spend nearly a month on the continent this August and September, playing a total of 20 dates. In a Facebook post, the band promise a "new show, new songs & new visuals." A trio of Canadian stops have been included on the run. The band will first play Vancouver's Harbour Event Centre on August 17, followed by dates at Toronto's Rebel on August 25, and Montreal's Olympia on August 26. Tickets for the run go on sale Friday (February 8), with further details available through the band's official website. You can find a complete itinerary below.